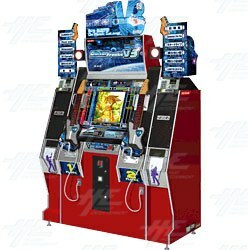 We currently have a special offer on Drum Mania (Korea machine) and Guitar Freaks V3 (Japan machine) combo machines. We have 4 units in stock priced at $7500 USD each. Both titles have over 400 music tracks to choose from and are linkable for multiplayer gaming. They are compatible with Konami's E Amusement service which provides a number of online features including Battle Mode and online ranking. In Guitar Freaks, the player attempts to press the keys on the guitar in a random sequence generated by the game in time to the music. The player must build the biggest combo he can to gain points and bonuses. To make these combos the player uses 3 button picking, a picking lever and an effector knob. There are 3 different levels of play available to the player. Drum Mania V3 can be linked up to Guitar Freaks v3 to simulate a jam session, with up to three players able to take part. The drum set consists of two cymbals, three drum pads and a foot pedal. The cabinet also has three buttons located next to the pads which are used to select and decide in the selection screens. All machines are English version and are ex Hong Kong warehouse.